Have you seen the animated show Spirit on Netflix? My daughter discovered the show sometime last fall, and has been hooked ever since. Not only have we watched the show, but she received the movie, Spirit: Stallion of the Cimarron, for Christmas. The movie is from years and years ago (2002) and is the basis for the show, but completely different as we discovered. In addition to the show and movie, she has also received two chapter books. Reading the books together has become one of our favorite bedtime routines. 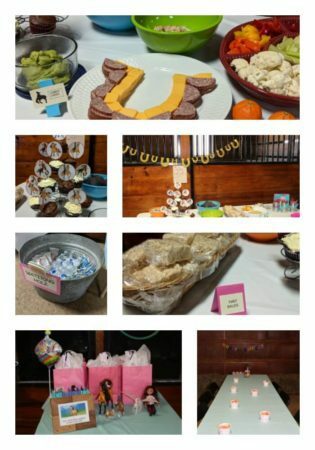 As Spirit became a part of our family, along came my daughter’s birthday, and she asked if she could have a Spirit-themed friend party – her first friend party. 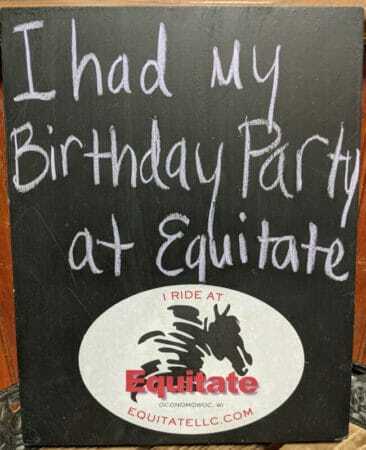 We brainstormed ideas together, and then I remembered an interview I did for Lake Country Family Fun, where a mom raved about her daughter’s birthday party at Equitate. My daughter was never so excited when I brought the idea up! Bridget Ward is the party planner at Equitate, and I cannot recommend her enough. She was amazing with the girls and the horses, and so patient. My youngest was excited to ride a horse, until she realized how tall the horse was, and became a bit overwhelmed and scared. 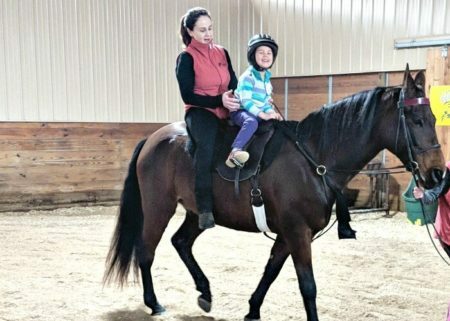 After watching the other girls ride for a few minutes, she decided to hop back on the horse, but only if Bridget rode with her – and she did! Of course then, she didn’t want to get off! Bridget planned the entire party out and it flowed smoothly. The party started by having the girls run around in the indoor arena on stick horses. When all the party attendees arrived, they were led around a tour of the stable, meeting a number of the show horses. The girls were then led back to the indoor arena. Bridget split the group into two groups of four each. While four girls rode, the others sat up in a viewing area and colored an American Saddlebreds poster. 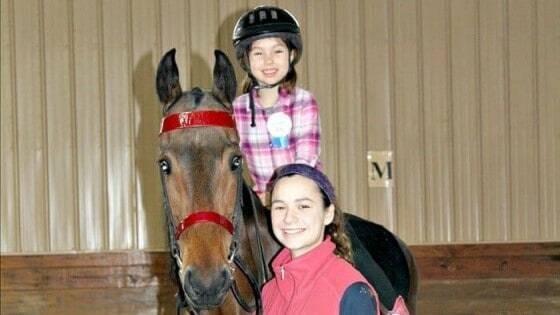 The riding girls were introduced to their horses: Trixie, IRS, Toro, and Ravin. They were then taught how to properly mount their horses, how to get them to trot (“Walk!”) and get them to stop (“Whoa!”). After about 25 minutes of riding, the groups switched. After riding, the girls were given a lesson in horse grooming. Bridget went through the various grooming tools and each girl had a chance to groom IRS, including ensuring that her hooves were clean and healthy-looking. 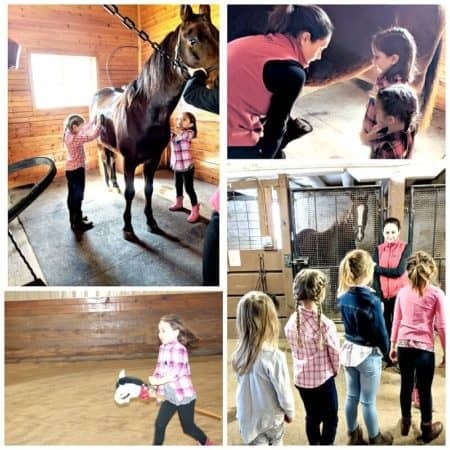 Following that, the girls were again split into two groups and led on a scavenger hunt throughout the stable to learn and find different horse-related items. By then the girls had worked up an appetite. So they washed up, had lunch, sang happy birthday, and enjoyed cupcakes. The girls weren’t the only ones who were hungry. The party ended by having each girl give the horses treats, because what’s a party without some treats?! If you have a horse-loving child or are as big of Spirit fans as we are, please check out the opportunities at Equitate, LLC. Not only do they offer birthday parties, but also a summer camp (with a deal if you sign up before April 30; more info here.) and an intro lesson package (more info here). 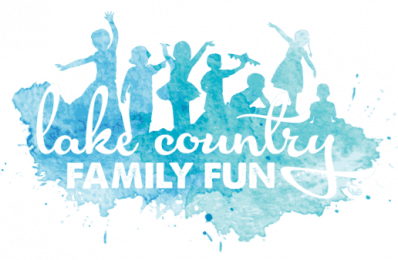 Disclosure: Even though Lake Country Family Fun was compensated, all opinions are my own.